A vivacious, red-headed dancer, actress, and singer, Verdon could be funny or tender, sassy or seductive, depending on the music and the mood. She studied dancing with Ernest Belcher from an early age, but initially followed her first husband into journalism, reviewing films and nightclub acts. After assisting the notable choreographer Jack Cole on “Magdalena” (1948), Verdon made her first appearance on Broadway two years later in “Alive and Kicking.” However, it was Cole Porter’s “Can-Can” that made her a star in 1953. Her thrilling performance as the (very) high-kicking Claudine gained her a Tony Award, and she won another two years later for her portrayal of the bewitching Lola in “Damn Yankees” (“Two Lost Souls,” “Whatever Lola Wants,” “Who’s Got the Pain?”), a show that was brilliantly choreographed by her future husband, Bob Fosse. He restaged his innovative dance sequences for the 1958 film version, for which, instead of casting an already established star, Verdon was invited to reprise her Broadway role. From then on, Fosse choreographed and/or directed all Verdon’s shows. 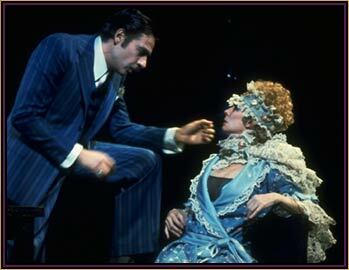 Jerry Orbach and Verdon originated the roles of Billy Flynn and Roxie Hart, respectively, in 1975's "Chicago." In 1957 she played Anna Christie in “New Girl in Town” (“Ven I Valse,” “On the Farm,” “It’s Good to Be Alive,” “If That Was Love”), a musical adaptation of Eugene O’Neill’s 1921 play, and on this occasion she shared the Tony with fellow cast member Thelma Ritter — the first time there had been a Tony tie. In 1959, Verdon won outright when she starred with Richard Kiley in “Redhead.” After that, Broadway audiences had to wait another seven years before they saw Verdon on the musical stage, but the wait was more than worthwhile. In “Sweet Charity” (1966) she played a dance hall hostess with a heart of gold who yearns for marriage and roses ’round the door. Cy Coleman and Dorothy Fields provided her with some lovely songs, including “If My Friends Could See Me Now” and “There’s Gotta Be Something Better Than This.” Verdon’s final Broadway musical was “Chicago” (1975), a razzle-dazzle affair set in the roaring ’20s, full of hoods and Chita Rivera. She then turned once more to films. She had appeared in several during the ’50s, including DAVID AND BATHSHEBA, ON THE RIVIERA, MEET ME AFTER THE SHOW, THE MERRY WIDOW, THE I DON’T CARE GIRL, and THE FARMER TAKES A WIFE, as well as DAMN YANKEES. In 1983, she played a choreographer in the television movie LEGS, and had several other good roles in big-screen features such as THE COTTON CLUB, COCOON, NADINE, COCOON: THE RETURN, and ALICE. In 1992 she donated a substantial amount of material documenting her own career and that of her late husband, Bob Fosse (he died in 1987), to the Library of Congress. 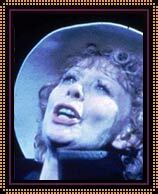 A year later, Gwen Verdon received the 1993 New Dramatists Lifetime Achievement Award at a ceremony in which fellow Broadway legends such as Richard Adler, Chita Rivera, Cy Coleman, John Kander, and Fred Ebb gathered to pay tribute. She continued to be honored throughout the ’90s, with the Broadway Theater Institute’s award for Lifetime Achievement in the Theater, the Actors’ Fund of America’s Julie Harris Lifetime Achievement Award, and the National Medal of Arts, which she received from the U.S. President in November 1998. During that year Verdon had been serving as Artistic Director on a tribute to her late husband entitled “Fosse: A Celebration in Dance and Song,” which opened on Broadway in January 1999.